Silver Lake has developed into a neighborhood proud of the hang out spots it has to offer. The hip, trendy bar atmosphere isn’t as overbearing as the nightclub laden scene in Hollywood, and much more welcoming. Locals are prideful of the fact they can enjoy a late night snack and expertly mixed cocktail without the drag of having to drive anywhere. That being said, visiting a bar in in the area is pleasant once the dreaded hassle of finding parking post-rush hour is overcome. The Friend bar along Hyperion Avenue is one of the newest additions to Silver Lake, having opened at the beginning of the year, but has quickly become a favorite of locals and those looking to bask in the atmosphere of the neighborhood. Highly experienced bar-entrepreneur Jared Meisler was the spearhead behind the opening of the Friend, along with partners on the project, famed Swedish street artist André Saravia, and Maroon 5 drummer Mickey Madden. The decor and stylization of the bar can best be described as 1950’s diner meets 1980’s pop-art explosion. The cotton candy exterior, although overwhelming for some, is ultimately inviting and playful. 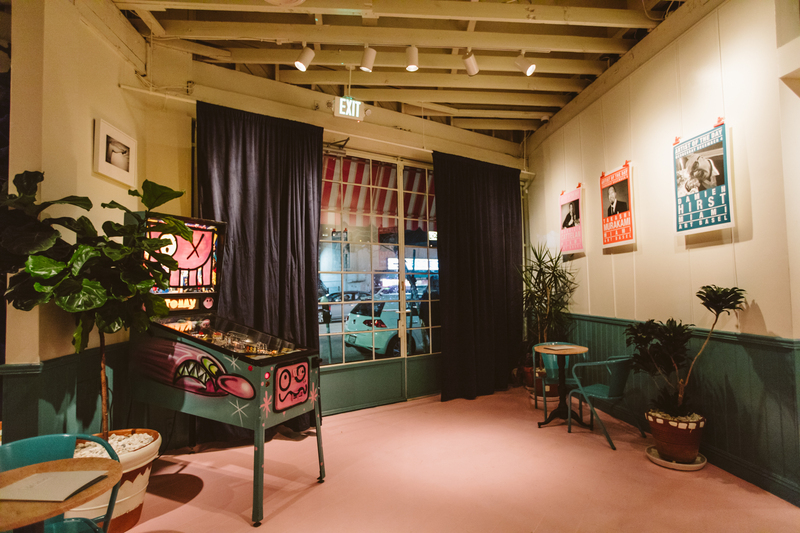 The interior pink tile floors, red and white striped awnings, baby blue wall paneling, diner style tables and booths, pinball machines and plants scattered throughout make tie the whole theme together. The instantly recognizable art by André can be seen throughout the exterior and interior of the establishment, along with art by Kenny Sharf, Aaron Rose and Tofer Chin. 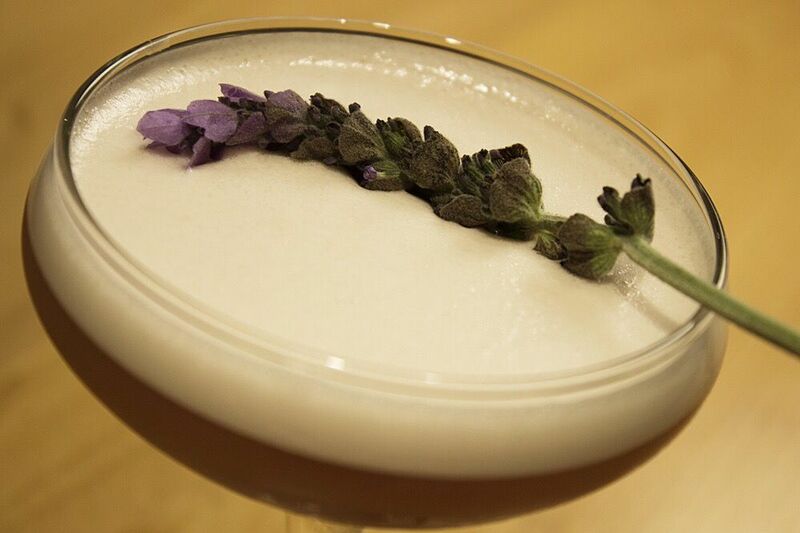 A thoughtfully curated cocktail menu perfectly suits the diverse palettes of the area. There’s also a solid beer and wine list to choose from. Most cocktails are in the $12 range, while there is the tried-and-tested combo of a shot of bourbon and tallboy of PBR for $10. Drink standouts include; The Face, made from vodka, black tea, cucumber, mint and lime; The Hustler, made with mezcal, vanilla, lime and agave syrup; and The Producer, which takes Jack Daniel’s, club soda, lemon, basil, lavender bitters and powdered sugar. Initially in charge of the French-inspired bar food menu was Iron Chef alum, and the man behind Maré, Eric Greenspan. Aimed to accompany the libations, the food gives you that extra bit of energy needed to make it through your next round of drinks. Staples include roasted chicken, steak fries, burgers, charcuterie and salads. The Friend Bar is located at 2611 Hyperion Ave in Silver Lake. They’re open everyday from 7:00pm – 2:00am.